Last Passing of Summer is the highly-anticipated follow-up to Canadian guitarist/composer David Lindsay’s 2015 Nightbound. Both albums were produced by Will Ackerman at his Imaginary Road Studios in Vermont. Co-produced and engineered by Tom Eaton, the album features acoustic guitar solos as well as ensemble pieces with several of the outstanding musicians (including Ackerman, himself!) who often appear on recordings done at Imaginary Road. All twelve tracks are quiet and very soothing, and, as is true of all Ackerman/Eaton productions, the sound quality is warm and clear but never too bright. I made the mistake of putting Last Passing of Summer in my wake-up CD player and it didn’t wake me up for several mornings in a row - a personal endorsement for the soft-spoken, peaceful vibe of Lindsay’s music! From 1985-2000, David Lindsay recorded and performed in concert, on television and on live radio in Canada. For the next fifteen years, he practiced law and studied the lute before returning to the guitar and his “comeback” album, Nightbound. Nominated for a Zone Music Reporter Award for 2015, I would say that Last Passing of Summer will be at least as well-received - and should be! 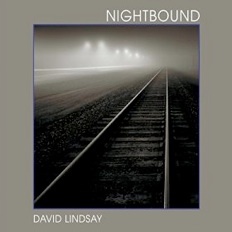 Often poignant and hauntingly beautiful, David Lindsay’s music is masterful and understated yet emotionally rich. The album opens with “For Joni,” a lovely trio for guitar, violin (Charlie Bisharat), and cello (Eugene Friesen). It begins with a spare but heartfelt guitar solo, with the other two musicians coming in a bit before the halfway mark - a soulful beginning! Ackerman (acoustic guitar) and Eaton (bass) join Lindsay on “Blue Skies,” a warm and very gentle piece that expresses a musical definition of “peaceful.” “To The Sun” features the full ensemble with the four musicians mentioned above plus Noah Wilding (wordless vocals), Jill Haley (English horn), Eaton on piano and bass, and Jeff Haynes on percussion - a warm and delicate massage for the mind! “Through the Fields” features Ackerman on “parlour guitar,” Wilding’s vocals, and Eaton on piano, bass, keyboards and electric guitar (I’d love to see him do that live!!!). Very free and relaxed, it’s a beauty! “Reverie” is an acoustic guitar duet with Eaton adding tonal colors and textures on piano, bass and cymbals - very velvety and dreamlike! The title track is an elegant yet haunting guitar solo that captures the promise of summer’s return after the frost and colors of fall have set in - definitely a highlight on the album! My favorite piece on the album, “Sorrows of the Moon,” takes its title from the poem by French poet Charles Beaudelaire and again features the Lindsay/Ackerman/Eaton trio with Eaton on keyboards this time - gorgeous! Also a favorite, “Night Vision” is a soulful duet with Lindsay and Bisharat that really tugs at the heartstrings - perfect in its simplicity. “The Wind Shapes the Pines” is a reflective guitar solo that brings this excellent album to a close. 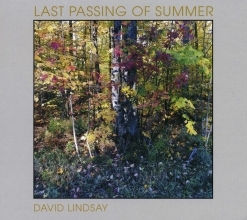 David Lindsay establishes himself as a major player on the music scene with Last Passing of Summer - and rightly so! It is available from Amazon and CD Baby.